On November 12, 2013 an agreement was finalized that will allow with Sunrise Water Authority (SWA) and Clackamas River Water (CRW) to work together as an agency under the Oregon Revised Statute (ORS) 190. Our newly formed ORS 190 organization, Clackamas Regional Water Supply (CRWS), will have a board of 6 commissioners representing both agency’s customers, with three from CRW territory and three from SWA territory. Clackamas River Water was formed in 1995 when Clairmont Water District and Clackamas CRW FormationWater District merged. 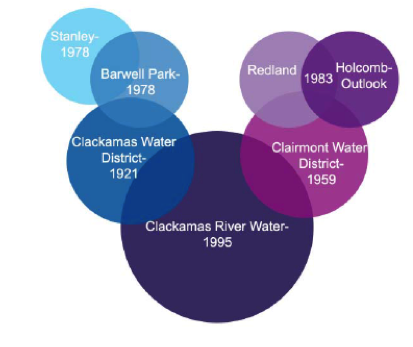 Both Clairmont and Clackamas Water were formed as the result of other water districts merging. While SWA and CRW are not merging; sharing resources and increasing efficiencies are not new ideas for water districts in the region. The CRW water treatment plant has certain set costs; whether producing 8 million gallons a day (MGD) or 20 MGD of water costs for things like salaries don’t change much. Under the agreement CRW will sell up to 10 MGD to SWA using the CRW plant more efficiently. CRW and SWA both own, maintain and occasionally rent the equipment necessary for the treatment and distribution of clean water. Under our new agreement, both entities can reduce costs by sharing equipment and maintenance, which could include anything from backhoes to accounting software. Both agencies will be able to share labor costs by splitting the costs of needed services such as human resources, information technology, billing and engineering. 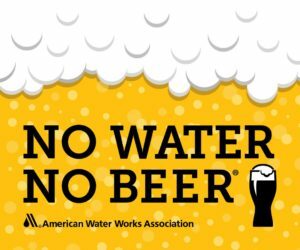 Why have the two water utilities created a new cooperative agreement? The two agencies border one another and provide similar services. There are a number of opportunities for the two agencies to cooperate, reducing their individual costs and enhance operations. What is the source of CRW’s water? Does CRW have enough surplus water available to sell to Sunrise? Both utilities use the Clackamas River as their main source of water supply. CRW has ample water rights on the Clackamas River and its treatment plant can produce up to 24 million gallons per day (mgd). With a current peak demand of only 9 mgd to serve CRW customers, this leaves plenty of surplus capacity to help meet Sunrise’s long-term needs. Why does Sunrise need water? Sunrise serves a growing community and needs additional water to support planned economic development and housing expansion in the future. Under the new agreement Sunrise would receive up to 10 mgd to help meet its current and future needs. How does CRW benefit, along with its customers? The agreement gives CRW a permanent paying water customer for its unused water and allows the District to more fully utilize infrastructure investments already made by ratepayers. Under the agreement, Sunrise will pay its fair share of the operating costs and future water system improvements associated with its water use from CRW. Do Sunrise and its customers benefit, too? With its current supply facilities nearing capacity, the clear choice for Sunrise is to make use of existing resources and infrastructure in an attempt to reduce the overall cost of water system operations and supply for Sunrise and CRW. The alternative for Sunrise is to build additional capacity on its own while CRW’s existing resources are underutilized, costing all parties more money. What services do the two utilities already share? 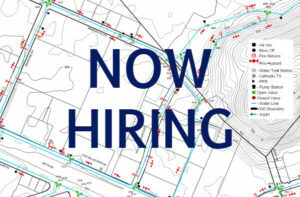 CRW and Sunrise have already begun sharing labor, equipment, and services at cost, including water quality testing, engineering, facilities mapping, and planning. They also share a pipeline that connects the CRW treatment plant with neighboring facilities owned and operated by the South Fork Water Board and North Clackamas County Water Commission. Does the cooperative agreement change the utilities’ service boundaries? No. CRW is currently subject to boundary changes in the future through the process of municipal annexation; Sunrise is not. This agreement would look to extend the boundary protections granted to Sunrise across the service territories of both agencies, giving CRW certainty in its future plans for serving its customers. Are any new facilities needed? Yes, but only to convey additional water to Sunrise. CRW’s drinking water treatment plant has ample capacity to serve Sunrise up to 10 mgd, without expansion or upgrades. The need for added pipeline capacity would be paid by Sunrise. The agreement creates a water pricing model that recovers the full cost of service provided by CRW for both treatment and delivery. 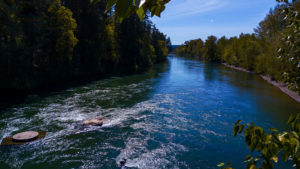 How will this agreement impact the Clackamas River? The Clackamas River will not be impacted. The agreement will utilize CRW’s existing water rights which have been fully permitted by the Oregon Water Resource Department. No additional water rights from the Clackamas River will be required. How will customers’ water rates be affected? The cooperative agreement will yield long-term savings for CRW and Sunrise customers. The goal is to make maximum use of existing resources and facilities, while avoiding the unnecessary and costly option of building additional capacity. Costs for future upgrades to the water treatment plant and delivery system will also be shared proportionate to use. Will the agreement create another agency? Yes, a separate agency will be formed similar to South Fork Water Board or the Washington County Joint Water Commission. However, no additional staff or facilities will be needed to implement this new agency. Its main purpose is to oversee the sale of water. How will this new agency be governed? Who is in charge? The agreement will be governed by equal representation from the two utilities’ elected Boards of Commissioners. The full Boards will, in turn, remain in charge of their separate utilities. Decision making will require a majority vote, meaning at least one member from each representative Board must agree on every issue at hand. Will the two water utilities be merged? This is not a merger. The two utilities will continue to operate as independent entities, serving their respective customers under the direction of their own Boards of Commissioners.